"Knopfler" redirects here. For his brother, see David Knopfler. Since Dire Straits disbanded in 1995, Knopfler has recorded and produced eight solo albums, and, as with his previous band, produced many hit songs. He has composed and produced film scores for nine films, including Local Hero (1983), Cal (1984), The Princess Bride (1987), Wag the Dog (1997) and Altamira (2016). In addition to his work with Dire Straits and as a solo artist and composer, Knopfler has recorded and performed with many prominent musicians, including B.B.King, Chet Atkins, Chris Botti, John Anderson, the Chieftains, Eric Clapton, Bob Dylan, Elton John, Bryan Ferry, George Jones, Emmylou Harris, Jools Holland, Sonny Landreth, Phil Lynott, Van Morrison, Steely Dan, Sting, and James Taylor, sometimes working as a session musician. He has produced albums for Tina Turner, Bob Dylan, and Randy Newman. 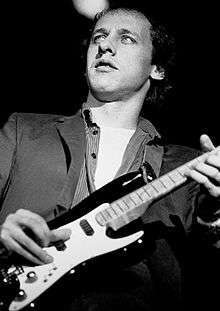 Mark Freuder Knopfler was born on 12 August 1949 in Glasgow, Scotland, to an English mother, Louisa Mary, and a Hungarian-Jewish father, Erwin Knopfler. His mother was a teacher and his father was an architect and a chess player whose anti-fascist sympathies and Jewish parentage forced him to flee from his native Hungary in 1939. Knopfler later described his father as a Marxist agnostic. In 1968, after studying journalism for a year at Harlow College, Knopfler was hired as a junior reporter in Leeds for the Yorkshire Evening Post. Two years later, he decided to further his studies, and went on to graduate with a degree in English at the University of Leeds. In April 1970, while living in Leeds, Knopfler recorded a demo disk of an original song he had written, "Summer's Coming My Way". The recording included Knopfler (guitar and vocals), Steve Phillips (second guitar), Dave Johnson (bass), and Paul Granger (percussion). Johnson, Granger, and vocalist Mick Dewhirst played with Knopfler in a band called Silverheels. On graduation in 1973, Knopfler moved to London and joined a High Wycombe-based band called Brewers Droop, appearing on the album The Booze Brothers. One night, while spending time with friends, the only guitar available was an old acoustic with a badly warped neck that had been strung with extra-light strings to make it playable. Even so, he found it impossible to play unless he finger-picked it. He said in a later interview, "That was where I found my 'voice' on guitar." After a brief stint with Brewers Droop, Knopfler took a job as a lecturer at Loughton College in Essex — a position he held for three years. Throughout this time, he continued performing with local pub bands, including the Café Racers. He also formed a duo with long-time associate bluesman Steve Phillips called The Duolian String Pickers. By the mid-1970s, Knopfler devoted much of his musical energies to his group, the Café Racers. His brother David moved to London, where he shared a flat with John Illsley, a guitarist who changed over to playing bass guitar. In April 1977, Mark gave up his flat in Buckhurst Hill and moved in with David and John. The three began playing music together, and soon Mark invited John to join the Café Racers. Dire Straits' first demos were done in three sessions during 1977, with Pick Withers as drummer, David Knopfler as rhythm guitarist, and John Illsley on bass guitar. On 27 July 1977 they recorded the now famous demo tapes of five songs: "Wild West End," "Sultans of Swing," "Down to the Waterline," "Sacred Loving" (a David Knopfler song), and "Water of Love." They later recorded "Southbound Again," "In the Gallery," and "Six Blade Knife" for BBC Radio London—and, finally, on 9 November, made demo tapes of "Setting Me Up," "Eastbound Train," and "Real Girl." Many of these songs reflect Knopfler's experiences in Newcastle, Leeds, and London, and were featured on their first album, the eponymous Dire Straits, which was released in the following year: "Down to the Waterline" recalled images of life in Newcastle; "In The Gallery" is a tribute to a Leeds sculptor and artist named Harry Phillips (father of Steve Phillips); and "Lions," "Wild West End," and "Eastbound Train" were all drawn from Knopfler's early days in the capital. On its initial release, Dire Straits received little fanfare in the UK, but when "Sultans of Swing" was released as a single, it became a chart hit in the Netherlands and album sales took off — first across Europe, and then in the United States and Canada, and finally the UK. The group's second album, Communiqué, produced by Jerry Wexler and Barry Beckett, followed in 1979, reaching number one in France while the first album was still at number three. There were frequent personnel changes within Dire Straits after the release of their third album, Making Movies, with Mark Knopfler remaining a constant member. Released in 1980, Making Movies moved towards more complex arrangements and production, which continued for the remainder of the group's career. 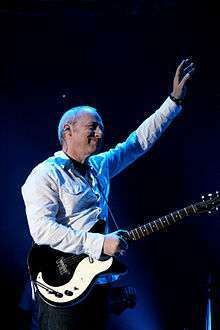 The album included many of Mark Knopfler's most personal compositions, most notably "Romeo and Juliet" and "Tunnel of Love." The studio album which followed was Love Over Gold, released in 1982. This featured the tracks "Private Investigations," "Telegraph Road," "Industrial Disease," "It Never Rains," and the title track to the same album. 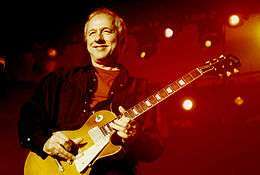 Mark Knopfler also took part in a comedy skit (featured on the French and Saunders Show) titled The Easy Guitar Book Sketch with comedian Rowland Rivron and fellow British musicians David Gilmour, Lemmy from Motörhead, Mark King from Level 42, and Gary Moore. Phil Taylor explained in an interview that Knopfler used Gilmour's guitar rig and managed to sound like himself when performing in the skit. In July 2011, it was announced that Knopfler would take time out from recording his new album to take part in a European tour with Bob Dylan during October and November. The next year Knopfler covered a Bob Dylan song, "Restless Farewell", for an Amnesty International 50th Anniversary celebration record. Mark Knopfler has been married three times, first to Kathy White, his long-time girlfriend from school days. They separated before Knopfler moved to London to join Brewers Droop in 1973. Knopfler's second marriage in November 1983 produced twin sons, born 1987. His marriage ended in 1993. On Valentine's Day 1997 in Barbados, Knopfler married British actress and writer Kitty Aldridge, whom he had known for three years. They have two daughters. Knopfler has a collection of classic cars which he races and exhibits at shows, including a Maserati 300S and an Austin-Healey 100S. Knopfler is left-handed, but plays the guitar right-handed. The Asteroid (28151) Markknopfler is named after him. ↑ Knopfler, Mark (2005–2013). "Mark Knopfler". Discography of studio albums. Mark Knopfler.com. Retrieved 30 May 2013. ↑ "Mark Knopfler Biography". The Biography Channel. Retrieved 4 March 2008. ↑ "The 100 Greatest Guitarists of All Time:Mark Knopfler". Rolling Stone. 18 September 2003. Retrieved 26 April 2013. ↑ "About John Illsley". John Illsley Website. Retrieved 1 July 2009. ↑ "Dire Straits given plaque honour". BBC. 4 December 2009. Retrieved 16 October 2011. 1 2 "Sunderland honours Sultan of Swing". University of Sunderland. Retrieved 28 November 2013. ↑ "Third Honorary Degree". Mark Knopfler Official Website. Retrieved 15 October 2011. ↑ "Chess Scotland". Chess Scotland. 27 November 2005. Retrieved 30 June 2014. ↑ "AHF Presents: Nobel Prize Winners and Famous Hungarians: The American Hungarian Federation, founded 1906 (hires magyarok es olimpiai bajnokok) – Film, Arts and Media". Americanhungarianfederation.org. Retrieved 30 June 2014. ↑ "BIOGRAPHY: Mark Knopfler Lifetime". Lifetimetv.co.uk. 12 August 1949. Retrieved 30 June 2014. ↑ "Mark (Freuder) Knopfler". Encyclopedia.com. Retrieved 8 September 2013. ↑ "Erwin Knopfler (1909–1993)". Chess Scotland. Retrieved 8 September 2013. 1 2 3 4 5 6 7 8 Kilburn, Terry. "Mark Knopfler Authorized Biography". Mark Knopfler News. Retrieved 15 October 2011. ↑ "Harlow College – Home". harlow-college.ac.uk. Retrieved 2 October 2015. ↑ "Chaos on the Sheepscar Interchange". Leedstoday.net. Retrieved 27 September 2014. ↑ Archived 16 October 2006 at the Wayback Machine. ↑ "Dire Straits Biography". Musician Guide. Net Industries. 2009. Retrieved 6 January 2009. ↑ "Duolian String Pickers Days : MarkKnopfler.com". markknopfler.com. Retrieved 2 October 2015. ↑ Kilburn, Terry. "Mark Knopfler Biography". Retrieved 12 October 2011. ↑ "Local Hero (Original Soundtrack) – Mark Knopfler". AllMusic. Retrieved 27 September 2014. ↑ "Mark Knopfler hurt in crash". News.bbc.co.uk. Retrieved 27 September 2014. ↑ "Queen head all-time sales chart". News.bbc.co.uk. Retrieved 27 September 2014. ↑ "Digitally Recorded, Digitally re/mixed and Digitally Mastered (psg)". News.ecoustics.com. Retrieved 27 September 2014. ↑ "David Gilmour – DVD Draw". Davidgilmourblog.com. Retrieved 27 September 2014. 1 2 "Mark Knopfler Authorized Biography". Mark-knopfler-news.co.uk. Retrieved 30 June 2014. ↑ "Dire Straits Biography on Enotes.com". Highbeam.com. Retrieved 27 September 2014. ↑ International Who's Who in Popular Music. Books.google.com. Retrieved 27 September 2014. 1 2 "Dire Straits lyrics, music, biography, records, band, album, videos, CD, and the discography including Dire Straits famous works". Musicianguide.com. Retrieved 1 July 2009. ↑ "Dire Straits Biography". Musicianguide.com. Retrieved 2 January 2012. 1 2 Youngs, Ian (7 October 2008). 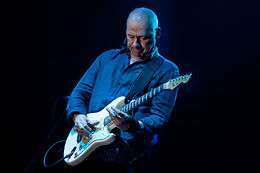 "Entertainment | Knopfler declines Straits reunion". BBC News. Retrieved 1 July 2009. ↑ Billboard 6 September 1997. Books.google.com. Retrieved 27 September 2014. ↑ Davies, H. "Rock star hurt in motorcycle crash", The Telegraph, 19 March 2003 Archived 23 November 2007 at the Wayback Machine. ↑ "2007gfrdhome". Guyfletcher.co.uk. 30 March 2009. Retrieved 24 September 2009. ↑ "The Official Community of Mark Knopfler". Markknopfler.com. 27 May 2009. Retrieved 1 July 2009. ↑ "2005 Shangri-La Tour Diary". Guy Fletcher Website. Retrieved 15 October 2011. ↑ Deedes, Henry (18 February 2009). "Knopfler serenades Garrick chums". The Independent. London. Retrieved 15 October 2011. ↑ "Thomas Dolby Prepares to Release First New Studio Album in 20 Years". Thomas Dolby Website. Retrieved 10 July 2010. ↑ "Mark to tour with Bob Dylan". Mark Knopfler Official Website. Retrieved 14 July 2011. ↑ Terry Kilburn (20 January 2012). "Amnesty International's Chimes of Freedom – Update". Retrieved 27 February 2012. ↑ Archived 27 October 2012 at the Wayback Machine. ↑ "Guy Fletcher, home of Dr Fletch, Mark Knopfler Keyboard Player and Solo Artist Inamorata". Guyfletcher.co.uk. Retrieved 27 September 2014. ↑ "2013 Mark Knopfler European Tour Diary by Guy Fletcher". Guyfletcher.co.uk. Retrieved 27 September 2014. ↑ "2013 MK USA Tour". Guyfletcher.co.uk. Retrieved 27 September 2014. ↑ "New album and European tour dates". MarkKnopfler.com. Retrieved 27 September 2014. ↑ Wright, M. (1997) The Mirror, London, England. Available from: "Mark Ties the Knot-fler Again; TV Kitty Is Wife No 3 in Paradise Wedding". Retrieved 15 May 2007. ↑ A Performer's Passion: Mark Knopfler, Racer (Documentary). London: Speedvision. 2006. ↑ "Le Mans Classic". Healey Sport. 2006. Retrieved 25 November 2012. ↑ "The BRITs 1983". BRIT Awards. Retrieved 28 November 2013. 1 2 "Grammy Awards 1986". Awards & Shows. Retrieved 28 November 2013. ↑ "Dire Straits". JUNO Awards. Retrieved 28 November 2013. ↑ "The BRITs 1986". BRIT Awards. Retrieved 28 November 2013. ↑ "The BRITs 1987". BRIT Awards. Retrieved 28 November 2013. 1 2 "33rd Grammy Awards 1991". Rock on the Net. Retrieved 28 November 2013. ↑ "Knopfler opens students' studios". BBC. 4 December 2001. Retrieved 28 November 2013. 1 2 3 4 "Mark Knopfler". Linn Records. Retrieved 28 November 2013. ↑ "Order of the British Empire". BBC. 31 December 1999. Retrieved 28 November 2013. ↑ Perlman, David (3 April 2003). "Scientists find cannibal dinosaur". San Francisco Chronicle. Retrieved 28 November 2013. ↑ "Mark Knopfler – What it is [Edison Music Awards −03]". YouTube. 28 May 2008. Retrieved 1 July 2009. ↑ "British Grove wins Best Studio accolade". Neve. Retrieved 28 November 2013. ↑ "Preisträger". Der Steiger Award. Retrieved 28 November 2013. 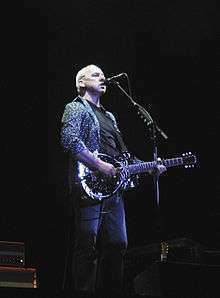 Wikimedia Commons has media related to Mark Knopfler. "True Love Will Never Fade"